Alfred Galpin (1901–1983) was among H.P. Lovecraft’s most brilliant and stimulating correspondents: a youthful prodigy, he had already become so knowledgeable in literature and philosophy that by 1921 Lovecraft wrote: “He is intellectually exactly like me save in degree. In degree he is immensely my superior—he is what I should like to be but have not brains enough to be.” Only 27 of Lovecraft’s letters to Galpin survive—Galpin himself destroyed the others—but they present a rich treasure-house of revelations over a period of nearly twenty years: Lovecraft tells of his youthful interests in chemistry and astronomy, his extensive involvement in amateur journalism, and his later conversion to moderate socialism. Also included are the surviving letters to the Gallomo, a round-robin correspondence cycle including Galpin, Lovecraft, and Maurice W. Moe. In these letters we find fascinating accounts of Lovecraft’s dreams, remarks on the inspirations for his early horror tales, and further details on amateur journalism controversies. Lengthy letters written jointly to Galpin and Frank Belknap Long relate to his travels along the eastern seaboard. As an appendix, a substantial amount of Galpin’s writings—some never-before published—are included, shedding further light on the Lovecraft-Galpin relationship. Extensively annotated by leading Lovecraft scholars S.T. Joshi and David E. Schultz, this volume illuminates one of the great literary personalities of his time—and in his own words. It is the first of a projected series of volumes of Lovecraft letters, presented in unabridged form and with detailed notes and commentary. H.P. 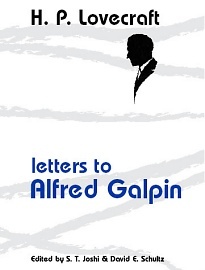 Lovecraft: Letters to Alfred Galpin.. By H.P. Lovecraft, Edited by S.T. Joshi & David E. Schultz. New York, NY: Hippocampus Press; 2003; ISBN 0-9673215-9-X; Softcover, 287 pages. This book may be purchased in softcover from Amazon.com or Barnes & Noble or directly from the publisher, Hippocampus Press.